Oh, oh, oh, I get so angry sometimes. So I wake up the other morning and see a front page story in the Oregonian newspaper about a huge planting of pinot noir on the eastern side of the Willamette Valley, south of Portland. Great. I'm sure there is lots of potential for grapes on the largely unexplored eastside. My first homemade pinot noir was from what I jokingly refer to as the terroir of Mollala. I've had home wine from John Eliasson of La Bete Winery from the mid-1980s from grapes out Estacada way that was terrific. The westside dominates today, but like the Sonoma Coast's rise in the past 15 years, we may yet see the eastside gain respect. But the essence of this story was that the rolling hills of the east valley are ideal for mechinized cultivation and harvesting of pinot noir. Chuck Wagner of Napa Valley's Caymus winery even endorsed the whole idea. Great. A cab producer thinks machine harvesting is terrific for the Willamette Valley. The writer chimes in that machine harvesting is used elsewhere, and we can cut costs 20% to 30%. ...a few investers and farmers are touting mechanical harvesting and mechanized farming as the path to success for Pinot Noir in the eastern Willamette Valley. I wish them luck, and sincerely wish everyone in this business success, but there are some serious problems with that approach. Nowhere in the world is Pinot Noir mechanically harvested on a regular basis and then made into a quality wine. You just can’t do it with Pinot - it needs too much loving care and attention, and every corner you cut in the production process dramatically lowers the quality of the wine. Yes, mechanical harvesting is in regular use in Burgundy - in CHABLIS, where they grow only Chardonnay. And even there, the top quality producers take the time and care and extra expense to harvest by hand. There simply are no shortcuts to good Pinot Noir. If the goal is to produce decent $15-$20 wines, California is already doing that to the tune of tens of millions of cases a year. 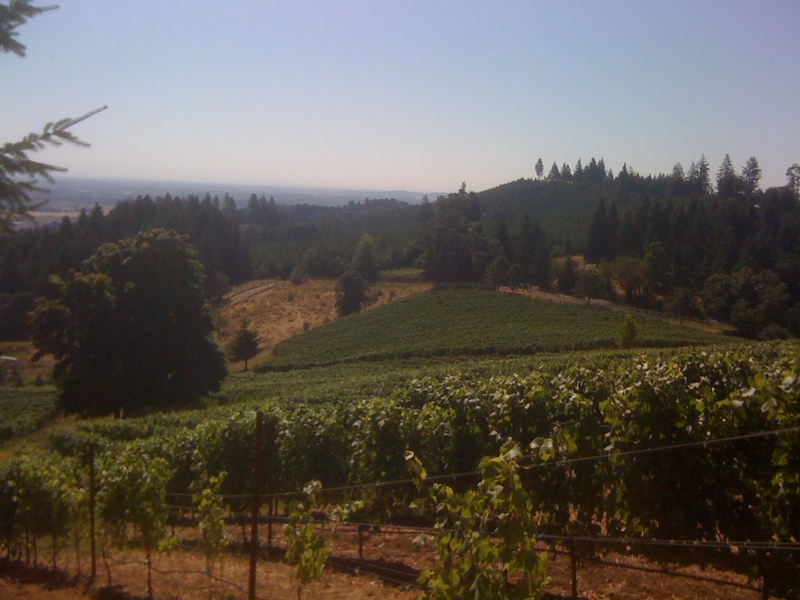 The truth for me is, our competitive advantage in Oregon pinot noir is the handmade factor of our wines. Scott's exactly right -- there's plenty of competition at the low end. There are lots of places that make good enough low end wine. While there's plenty of competition at the high end, there's no other place on earth that makes handmade Oregon pinot noir. There we have a chance at distinction. It may not be easy, but it's our best shot at market success and winemaking relevance. The folly of cutting costs with machine harvesting huge tracts of pinot is just that, folly. Pinot is hard to make well cheaply. It's the truffle of wine world. It may not be for everyone. It may not be the most economical product out there. But it's hauntingly, memorably unique and worth the hunt it requires. There is no substitute for that. Hey. We've been writing for years about our winemaking project. 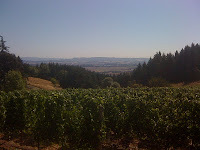 Working harvests around the Willamette Valley. Making wine in the garage. Holding the ever popular garage tastings. Making the jump to commercial winemaking with the 2009 vintage. Well Tuesday we're bottling those first wines. And on September 18 we'll have our first open house at the winery in NW Portland, at 2621 NW 30th Avenue. We'll be joined by our friends Helioterra wines, who'll be pouring wines too. Hours are noon to 5pm. Come on down. Read the Vincent Wine Company site for more information. Hope you can be there. 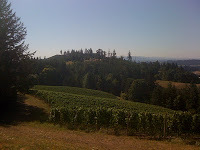 A few days back I had the opportunity to visit the beautiful Luminous Hills estate vineyard of Byron and Dana Dooley, high in the foothills of the Oregon coast range. 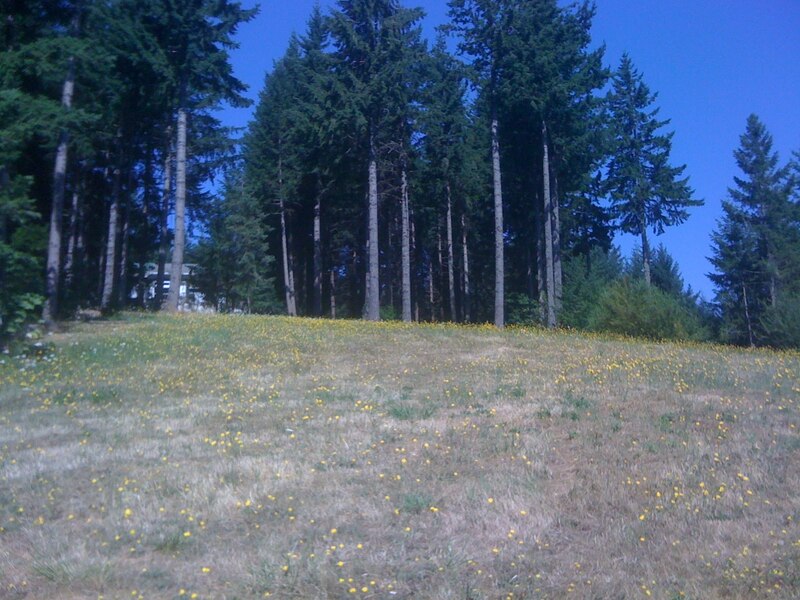 Technically this site lies in the sprawling Yamhill-Carlton District AVA. The address however is McMinnville and the site probably has more to do with the McMinnville AVA than Yamhill-Carlton. Perhaps it's something different altogether. 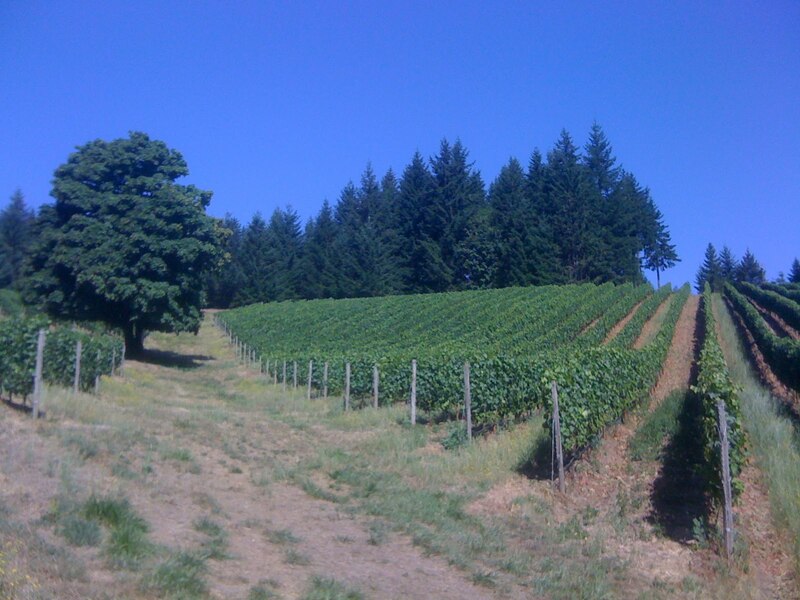 First, soils types vary here as they tend to in McMinnville. Instead of the typical Willakenzie series sediments of the Yamhill-Carlton District, we see that and the volcanic Jory soils more common in the Dundee Hills. Also, the elevation here is high, 600 to 800 feet, whereas most of the Yamhill-Carlton District is mid- to low elevation, typically on rolling hills that simply don't reach as high as this southwest corner of the growing region. 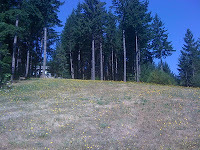 The Luminous Hills site was planted in the spring of 2006. Byron started our vineyard walk on the far west slope, where the sedimentary soils are planted to the Pommard and 115 clones of Pinot noir. The uppermost block of Pommard is on raparia gloire rootstock to devigorate the vines while the rest of the vineyard is on the workhorse 101-14 rootstock. Remember that most vineyards the world over contain grape varieties grafted onto disease resistant rootstock. 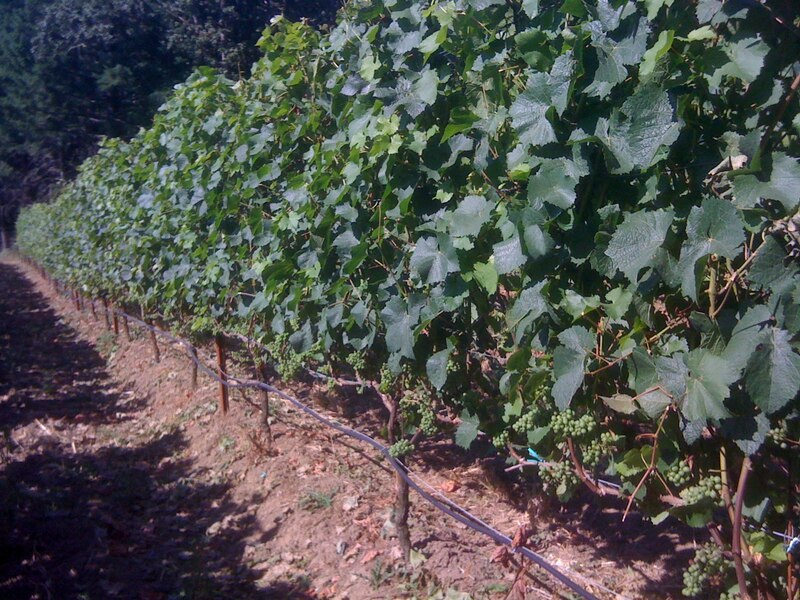 Nothing different here, though rootstock selection can affect how the vines grow. Things look good in the Pommard blocks and across the entire estate. Leaves have been pulled a few weeks back, exposing the fruit to light and allowing for better air flow. A second hedging happened just a few days ago. Perhaps another won't be necessary as the vines are focusing more on ripening fruit this time of year. Plenty of leaving remain for ripening, probably in October given the elevation and our cool summer. Below the Pommard blocks we find the 115 clone, which set a bit heavier. The vineyard crew will drop more fruit here and clip off more wings and shoulders to leave fewer and small grape custers, all the better to be nicely ripe come harvest time. On the eastern side, we find the volcanic Jory soils. Here Byron planted the 667 and 777 clones to give a little more spice to what can be more fruit driven variants of Pinot noir. Most of the vineyard if fairly steep, and it's especially clear in the long sloping rows of these uppermost blocks. In the swale between blocks, you see a gorgeous old Oregon oak that the Dooleys couldn't help but leave in the vineyard. From the top the view is magnificent, even luminous. The name is apt and the wines gorgeous. I've written about them before and I'll follow this post with some thoughts on the latest wines I tried later in the day of this visit. Needless to say, if you can find either of the 2008s from Luminous Hills, the estate bottling or the more limited "Lux" bottling, try them. They are tremendously delicious and interesting wines that should cellar and evolve nicely. 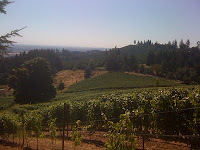 Above this top area of the vineyard is a fallow area that Bryon says might be planted to white wine, perhaps gruner veltliner. No plans are definite yet, but I like the idea of planting something unusual in this area. Some local gruners, the grape of Austria, have shown great promise. Knowing Bryon's style of winemaking, I bet he'd make something of benchmark quality for our region. Overal, I came away from this vineyard walk even more excited about Luminous Hills than I was at the start. There are several excellent producers in our region, makers of the highest quality. While Luminous Hills is pretty new, I'm ready to put them up there in that top eschelon. I'm not much for rankings, but clearly this site is special and the wines from it equally so. I've written before that I must disclose that he and I are both sourcing fruit from the new Armstrong vineyard on Ribbon Ridge, so take my words with that in mind. Truth be told, I'm looking forward to learning from Byron. That's part of why I'm so excited. He's such a modest guy, he just shrugs that off, saying he thinks he's going to learn from me. Perhaps, but I'm guessing I'll get the better end of that deal. In case you want to read what we emailed out to our mailing list members, check out the latest post on the Vincent Wine Company news page. It's never too late to join our email list, but this futures offer is only good through August 31. So pick what you want and let us know by the end of this month and we'll get you our first wines this fall. Yeah, I'm just getting around to reading and now writing about The Billionaire's Vinegar. You don't come to élevage for breaking news, at least I hope not. We're more reflective here. And so it will be for a "book review" of a book that's not exactly new nor will be reviewed in much depth. It is a fun read. Check it out if you're a wine geek with some interest in history and nothing more pressing on your night stand. It's summer. This is a good page turner. Of course, you might instead peruse the newly released 3rd edition of The Great Domaines of Burgundy too. That's not exactly a page turner though. The Billionaire's Vinegar tells the story of the alleged and now infamous 18th century Jefferson bottles of Ch. Lafite. How "super collector" Hardy Rodenstock, nee Meinhard Görke, allegedly conned wine experts and the world into believing these bottles were authentic and once owned by the author of the US Declaration of Independence. And how reputations of those experts, Michael Broadbent chief among them, were tarnished irreparably. Yes, it's a fun read though the author sure seems to be bent on vengence for a crime or misdeed commited against the insufferably rich. I get the logistics. I failed to care too much about their plight. It's pathetic all around but the author doesn't come out smelling so good to me, what with his reveling in pinning the guilty with their guilt. One wonders how much fiction is in this work of nonfiction. Nevertheless, I finished it and can't help reflecting on the odd confluence of characters and events that I first came across nearly 20 years ago as I somewhat spontaneously got into wine. We all have our wine epiphany stories, right? Actually, I have several and they all come out depending on what feels right in the moment. I got into wine because my family enjoyed wine, not much fancy though apparently my paternal grandfather enjoyed Chateauneuf du Pape. I grew up and, voila, I became interested. So I grew up with wine. No, I got into wine because, during a seminal visit to San Francisco in the mid-70s for a family reunion when I was but a wee lad, I accompanied several family members to go wine tasting. It was a fairly long drive. I remember little of where we went, but I did talk to an older cousin on the ride about her dream of trees that grew bubble gum. Or perhaps I remembered more than I give credit. Years later, visiting Napa (where we most certainly went), I entered the "new" barrel room at Inglenook (now Coppola) and the sight of hundreds of barrels stacked several high, and the unmistakable smell of wine soaked oak and perhaps even redwood, it all hit me like a ton of bricks. I remember that smell from that day, and I bet this was at least one of the stops we made. It actually looked familiar, and that's odd in my experience of returning to places I knew I'd been. They never look the same, and here was a place I never guessed I went but now believe I did. That's a pretty good "wine's in my bones" story, no? Well, I studied abroad in college in England and visited France extensively and studied for half a year in Austria and visited wineries in the latter two places, traveling and drinking wine in Italy and Germany as well. I went to St. Emilion and Tuscany and the Wachau and the Rheingau, all without being a wine geek. My time in Austria taught me about dry Austrian wine, though I don't recall hearing the words gruner veltliner, which I most certainly did hear, at some point anyway. So I'm one of those "I got into it as an exchange student in Europe" people. They always sound insufferable, so let's skip that one. Then there are my several siblings, among them two of my brothers, one close in age and another more than a decade ahead of me. Both had some interest in wine and encouraged me, upon my return from Europe, to try Napa cabernet from Steltzner, in the Stags Leap area. After graduating from college, on June 17, 1991, to be exact, I had dropped a girlfriend off at SF airport for her flight home and drove to that brother's house in Sacramento. He said I had to try this 1986 Steltzner Cabernet. I did and it was delicious. Aromatic, not doubt oak laden but flavorful and quite good. That wine made an impression. Of course, I proceeded to leave the next day on a solo cross country road trip in a '66 Ford Mustang convertible and let's just say I forgot all about wine for that whole summer. So was that my wine epiphany? Maybe, but no, not really. Then fall came and I fled my summer destination of Chicago for California again and I was flailing. I was a new graduate with an English degree and a year bumming around Europe sandwiched in there while my classmates at home seemed to get serious overnight, land internships while I was away and undoubtedly had fabulous jobs. Me? I headed for the Liquor Barn. I was of age. I had time though little money. I guess I had prior wine experiences to draw me in. But really fate brought me there. And what did I find? Who knows what the wine was. But at the check out stand, I found...I'm ashamed to admit...um...Wine Spectator. Yes, my wine epiphany may indeed have involved Wine Spectator magazine. Many people could say the same, and really, I feign embarrasment. I'll own it. Here's this magazine devoted to wine and I grabbed it on an impulse and my life changed. Why? Everything in The Billionaire's Vinegar, that's why. There was an article on Michael Broadbent, the head wine man at Christie's, with a picture of him biking to work on the streets of London. How cool was that? There was an article of a hundred year vertical tasting of Ch. Lafite, including a few bottles of the second wine Carraudes de Lafite and positive notes from both those bottles and minor vintages of the main wine overlooked by those with lots of cash but not a lot of taste. Impressions were immediate and they have stayed with me. It wasn't the point of the lifestyle magazine, but read that you could ride your bike to wine auctions and champion so-called off vintages that delivered the goods if not the high price tags and drooling of collector types. And there was an article about so-called "super collector" Tawfiq Khoury, who merits some mention in the book as one of a club of international collectors in Rodenstock's circle, if only because of a shared interest in wine and appearance at flashy wine tasting events. Khoury seemed so down to earth to me in the interview despite his high profile. He loved wine. He obviously had and apparently still has boatloads of money. I recall him commenting that Ch. d'Yquem is a better investment than any CD account. Yet, I liked him in what I read. He had a photographic memory for the wines he tasted. I sort of wished I had the same. That issue or one soon enough had yet another reference to the Jefferson bottles. That girlfriend from the airport gifted me Broadbent's New Great Vintage Wine Book for my next birthday, a book that is repeatedly mentioned in The Billionaire's Vinegar for having countless notes from questionable Rodenstock tastings and even a postscript discussing and defending the so-called Jefferson bottles. Dubious connections aside, I knew about Broadbent from Wine Spectator and I loved the history told in his tasting notes. I still have the book and read though it, a relic in my own library. So reading The Billionaire's Vinegar wasn't so much of a revelation a tawdry story and its flawed characters; rather, a revisit with old acquaintances of a world I've never inhabited nor cared to, but found intriguing and oddly inspirational at the beginning of my wine journey. For that this book is worth reading and remarking upon. Perhaps your interest would be less personal, and though the new Great Domaines of Burgundy is something of much greater substance, I can't deny The Billionaire's Vinegar was a good read, indeed. ***Enjoy now. I have so many things to write about lately (and now little time to focus on writing). Along comes this unexpected delight and I'm compelled to interrupt a backyard session of rose and Remington Norman and Charles Taylor's 3rd edition of The Great Domaines of Burgundy to write. Unexpected, because as much as I love Evesham Wood, and I love Evesham Wood, their rose has never really hit the spot for me. Still, I keep trying and thankfully I do. Tonight I opened their latest and last (from the Raneys) release of rose and I'm left thinking this is the best Willamette Valley rose I've ever tasted. In case you're wondering, this Willamette Valley tempranillo comes from the Illahe vineyard near Dallas, right near the very well known Freedom Hill vineyard in the foothills of the coast range. Illahe has lots of different (for our area) grape varities planted, tempranillo among them. The color of this 2009 Evesham Wood Rose of Tempranillo is very, very pale copper. No iridescent pink or light red. Not even salmon. This is light. The fragrance is of good rose sparkling wine, with complex scents of strawberry and yeast and rocks, even chalk (which has no business being in a Willamette Valley wine). In the mouth, this wine is vibrant, even energetic with strawberry, lychee and mineral flavors, refreshingly dry and clean with nerve and a long lingering finish. My neighbor says it's a little sour. Me, I see the dryness as simultaneously thirst quenching and thirst inducing. This wine is so satisfying and yet you must have more. Pardon me as I resume my reading about some 140 top Burgundian estates, their vineyard sites and viticultural and winemaking techniques. One might think great Burgundy is required for such reading. Me, I'm drinking great Willamette Valley. I've often read about how blind tasting is the only way to properly evaluate wine. I'm usually one of those who bring up context in such situations. Wine, like almost everything, is about context for me. It matters where a wine is from, even what it is or is supposed to be. Tasting wine blind ends up more about finding faults, which can be helpful to a winemaker. It can be fun for the wine lover to try. But really, it has little to do with real wine appreciation. Tonight something else struck me. Just this morning I was reading about how people tend to smell or taste a wine descriptor when someone in the group finds it in their glass. We've all had that experience, in wine or anything else. It's the power of suggestion and it's usually met with eye rolling, as if we're cheating or noticing something that isn't there. Blind tasting must be silent, otherwise you'll get ideas in your head about things that aren't there, further ruining the objective evaluation of a wine. I'm sorry to say I've always assumed that's right. Then tonight I was struggling with replacing what seemed like a simple part on our water heater. I'll be honest. I'm not really handy. I do, however, read well and I have pretty good comprehension skills. At least I think so. Mechanical diagrams are a blind spot. I stared at the drawings that came with the part and simply couldn't make sense of them. Enter my neighbor, an engineer and embarrassingly handy guy. He looked at the diagram and helped me understand it. Of course, we figured out I'll need a technician type to take care of the job right. But he essentially pointed out details in something I was evaluating, details I hadn't noticed or understood without his help. Doesn't that happen a lot? I think it's called teaching and learning, and while wine isn't an objective thing like the diagram, what's wrong with noticing or understanding better a descriptive element in a wine after someone suggests it to us? It's not like it's made up. Some times people suggest things and I don't get it. So many other times people suggest things and they strike a true chord with me. That's real. A few years ago, my dad was on the board of a start up bank and went through an interesting experience when they were working on logo design and shared part of it with me. He asked me if I'd ever seen the FedEx logo. Yes, of course. Had I seen the arrow? Huh? The arrow. Hmm. No, I'd never seen or noticed the arrow. But it's there. Check it out for yourself the next time a truck rolls by. As he often said, I ain't making it up, pally.